The End of the Supermanager? 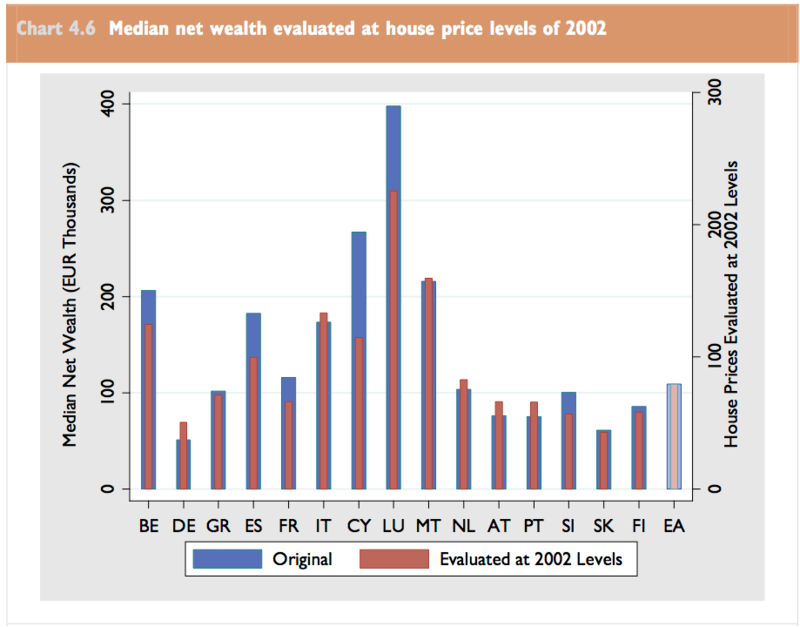 Everyone is talking about this new paper, Firming Up Inequality. It uses individual-level data from the Social Security Administration, matched to employers by Employer Identification Number (EIN), to decompose changes in earnings inequality into a within-firm and a between-firm component. It’s a great exercise — marred only modestly by the fact that the proprietary data means that no one can replicate it — exactly the sort of careful descriptive work I wish more economists would do. The big finding from the paper is that all the rise in earnings inequality between 1982 and 2012 is captured by the between-firm component. There is no increase in the earnings of a person in the top 1% of the earnings distribution within a given business, and the earnings of someone at the median for that same business. The whole increase in earnings inequality over this period consists of a widening gap between the firms that pay more across the board, and the firms that pay less. I’m not sure we want to take the results of this study at face value. Yes, we should be especially interested in empirical work that challenges our prior beliefs, but at the same time, it’s hard to square the claims here with all the other evidence of a disproportionate increase in the top pay within a given firm. Lawrence Mishel gives some good reasons for skepticism here. The fact that the whole increase is accounted for by the between-firm component, yet none by the between-industry component, is very puzzling. More generally, I wonder how reliable is the assumption that there is a one to one match between EINs and what we normally think of as employers. That said, these findings may be pointing to something important. As a check on the plausibility of the numbers in the paper, I took a look at labor income of the top 1 percent and 0.01 percent of US households, as reported in the World Top Incomes Database. And I found something I didn’t expect: Since 2000, there’s been a sharp fall in the share of top incomes that come from wages and salaries. 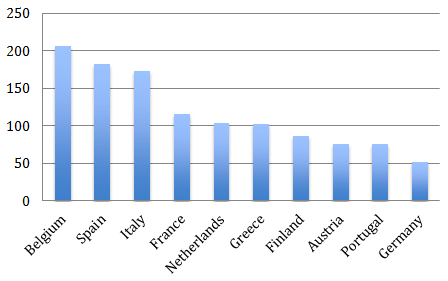 In 2000, according to the tax data used by Piketty and his collaborators, households in the top 0.01 percent got 61 percent of their income from wages, salaries and pensions. By 2013, that had fallen to just 33 percent. (That’s excluding capital gains; including them, the labor share of top incomes fell from 31 percent to 21 percent.) For the top 1 percent, the labor share falls from 63 percent to 56 percent, the lowest it’s been since the 1970s. Here is the average income of the top 0.01 percent over the past 40 years in inflation-adjusted dollars, broken into three components: labor income, all other non-capital gains income, and capital gains. 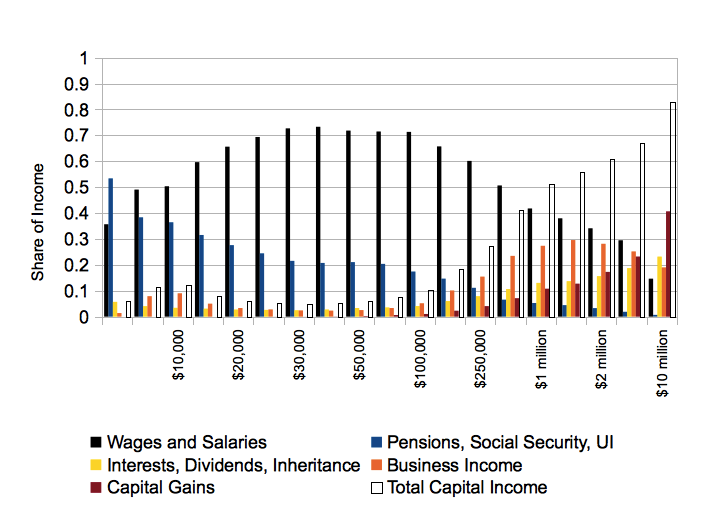 Average income of top 0.01% of US households, from World Top Incomes Database. 3-year moving averages. As you can see, the 1990s look very different from today. Between 1991 and 2000, the average labor income of a top 0.01% household rose from $2.25 million to $10 million; this was about 90 percent of the total income increase for these households. During the 1990s, rising incomes at the top really were about highly paid superstars. Since 2000, though, while average incomes of the top 0.01% have increased another 20 percent, labor income for these households has fallen by almost half, down to $5.5 million. (Labor income has also fallen for the top 1 percent, though less dramatically.) So the “Firming” results, while very interesting, are perhaps less important for the larger story of income distribution than both the authors and critics assume. The rise in income inequality since 2000 is not about earnings; the top of the distribution is no longer the working rich. I don’t think that debates about inequality have caught up with this fact. Fifteen years ago, the representative rich person in the US was plausibly a CEO, or even an elite professional. Today, they mostly just own stuff. Posted on June 3, 2015 June 3, 2015 Tags distribution, eat the rich, new research in economics8 Comments on The End of the Supermanager? Meanwhile, according to the IRS, the 35,000 New York households who make over $1 million have a total annual income of $135 billion. Don’t you love the Romney video? I’m not going to deny it, right now I am with Team Dem. It’s true, we usually say “the bosses have two parties”; but it’s not usual for them to run for office personally, themselves. And when they do, wow, what a window onto how they really think. It’s hard to even imagine the mindset where the person sitting in the back of the town car is the “maker” and the person upfront driving is just lazing around; where the guys maintaining the hedges and manning the security gates at the mansion are idle parasites, while the person living in it, just by virtue of that fact, is working; where the person who owns the dressage horse is the producer and the people who groom it and feed it and muck it are the layabouts. As some on the right have pointed out, it’s weird, also, that “producing” is now equated with paying federal taxes. Isn’t working in the private sector supposed to be productive? Isn’t a successful business contributing something to society besides checks to the IRS? It is weird. But as we’re all realizing, the 47 percent/53 percent rhetoric has a long history on the Right. (It would be interesting to explore this via the rounding-up of 46.4 percent to 47, the same way medievalists trace the dissemination of a text by the propagation of copyists’ errors.) Naturally, brother Konczal is on the case, with a great post tracing out four lineages of the 47 percent. His preferred starting point, like others’, is the Wall Street Journal‘s notorious 2002 editorial on the “lucky duckies” who pay no income tax. That’s a key reference point, for sure. But I think this attitude goes back a bit further. The masters of mankind, it seems to me, have always cultivated a funny kind of solipsism, imagining that the people who fed and clothed and worked and fought for them, were somehow living off of them instead. 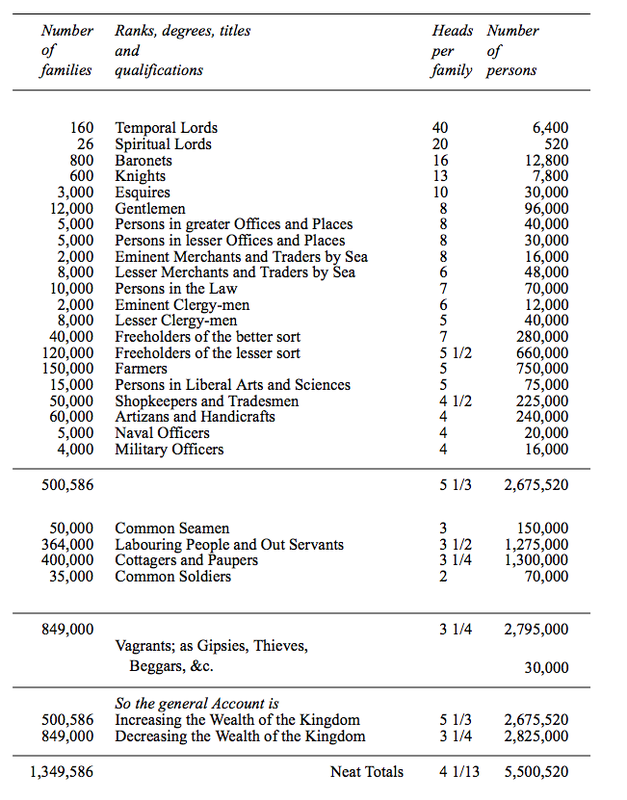 Here, as transcribed in Peter Laslett’s The World We Have Lost, is Gregory King’s 1688 “scheme” of the population of England. It’s fascinating to see the careful gradations of status (early-moderns were nothing if not attentive to “degree”); we’ll be pleased to see, for instance, that “persons in liberal arts and sciences,” come above shopkeepers, though below farmers. But look below that to the “general account” at the bottom. We have 2.675 million people “increasing the wealth of the kingdom,” and 2.825 million “decreasing the wealth of the kingdom.” The latter group includes not only the vagrants, gypsies and thieves, but common seamen, soldiers, laborers, and “cottagers,” i.e. landless farmworkers. So in three centuries, the increasers are up from 49 percent to 53 percent, and the lucky duckies are down from 51 percent to 47. That’s progress, I guess. One can’t help wondering how the wealth of the kingdom would hold up if the eminent traders by sea couldn’t find common seamen, if the farmers had to do without laborers, if there were officers but no common soldiers. Always more where they come from, I suppose Gregory King might say. 1. ‘The first part of the Gentlemen of England called Nobilitas Major.’ This is the nobility, or aristocracy proper. 2. ‘The second sort of Gentlemen called Nobilitas Minor.’ This is the gentry and Smith further divides it into Knights, Esquires and gentlemen. The fourth sort or class amongst us is of those which the old Romans called capite sensu proletarii or operarii, day labourers, poor husbandmen, yea merchants or retailers which have no free land, copyholders, and all artificers, as tailors, shoemakers, carpenters, brick- makers, brick-layers, etc. These have no voice nor authority in our commonwealth and no account is made of them, but only to be ruled and not to rule others. In other words, Elizabethan Mitt Romney, your job is not to worry about those people. Smith’s contemporary Shakespeare evidently had distinctions like these in mind when he wrote Coriolanus. (A remarkably radical play; I think it was the only Shakespeare Brecht approved of.) The title chracter’s overriding passion is his contempt for the common people, those “geese that bear the shapes of men,” who “sit by th’ fire and presume to know what’s done i’ the Capitol.” He hates them specifically because they are, as it were, dependent, and think of themselves as victims. One more instance. Did everybody read Daniyal Mueenuddin‘s In Other Rooms, Other Wonders? It’s a magnificent, but also profoundly conservative, work of fiction. In Mueenuddin’s world the social hierarchy is so natural, so unquestioned, that any crossing of its boundaries can only be understood as a personal, moral failing, which of course always comes at a great personal cost. There’s one phrase in particular that occurs repeatedly in the book: “They eat your salt,” “you ate his salt,” etc. The thing about this evidently routine expression is that the eater is always someone of lower status, and the person whose salt is being eaten is always a landlord or aristocrat. “Oh what could be the matter in your service? I’ve eaten your salt all my life,” says the electrician who has, in fact, spent all his life keeping the pumps going on the estates of the man he’s petitioning. Somehow, in this world, the person who sits in a mansion in Lahore or Karachi is entitled as a matter of course to all the salt and all the good things of life, and the person who physically produces the salt should be grateful to get any of it. Mueenuddin describes this world vividly and convincingly, in part because he is a writer of great talent, but also clearly in part because he shares its essential values. Just in case we haven’t got the point, the collection’s final story, “A Spoiled Man,” is about how an old laborer’s life is ruined when his master’s naive American wife gets the idea he deserves a paycheck and proper place to sleep, giving him the disastrous idea that he has rights. You couldn’t write fiction like that in this country, I don’t think. Hundreds of years of popular struggle have reshaped the culture in ways that no one with the sensitivity to write good fiction could ignore. A Romney is a different story. François Hollande, the leading challenger for the French presidency, has described the banking industry as a faceless ruler and his “true adversary”. As he launched in earnest his campaign to become France’s first socialist head of state since the mid-1990s, Mr Hollande said he would seek a Franco-German treaty to overturn the “dominance of finance” and re-orient Europe towards growth and big industrial projects. At a rally on the outskirts of Paris in front of thousands of supporters on Sunday afternoon, he said: “My true adversary does not have a name, a face, or a party. He never puts forward his candidacy, but nevertheless he governs. My true adversary is the world of finance.” … Mr Hollande promised, if elected, to separate the investment activities of French banks from their other operations, ban them from tax havens and establish a “public” credit ­rating agency for Europe. He also promised higher taxes for people earning more than €150,000 a year and attacked the “new aristocracy” of today’s super-rich. A financial transaction tax would be introduced, with France acting with other European countries willing to participate…. In a powerful speech that advisers said he had written himself over the weekend, the socialist candidate came out fighting, looking to make an impression on the broader French public by taking aim at some carefully chosen national bêtes noires. These included globalisation, unemployment and shrinking domestic industry. But uppermost were bankers…. Certain leftists I know will say this is just populist bluster, that nothing is finance’s fault, and that this kind of language is just a distraction from genuine radical politics. But it’s not all bluster: As Arin D. points out, French bankers seem to have been born on the wrong continent, too. Maybe we can arrange a swap?